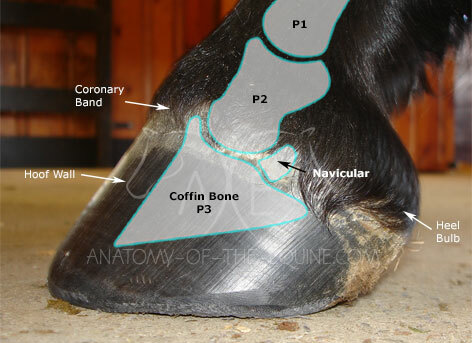 The coffin bone (CB) in the equine foot is known by many names. 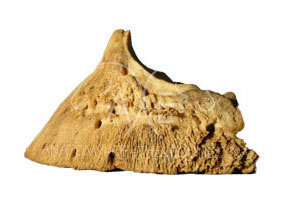 It is located in the front half of the hoof capsule and plays a vital role in both hoof form and function. The coffin bone is the foundation of the hoof. It's shape influences but does not dictate the shape of the hoof capsule. In the very young horse, the distal phalanx correlates well with the hoof shape. Foals are born with balanced, symmetrical pedal bones, but bone is very dynamic and is influenced by all kinds of forces. 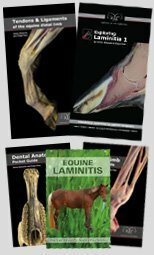 As the horse ages, the environment and load on the foot influence the hoof capsule and the bone. The hoof capsule distorts to counteract the various forces. The pedal bone adapts by changing shape and density. Tendons and ligaments are securely anchored to the pedal bone. Sensitive laminae cover the bone. The underside is blanketed with the sole producing corium. 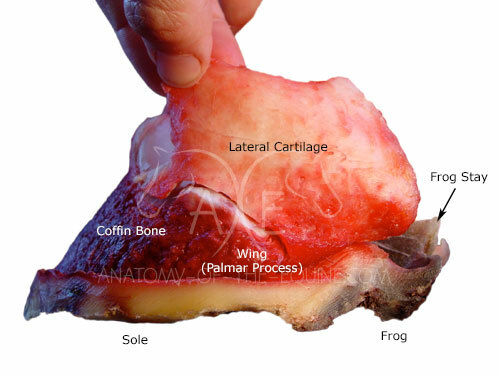 Lateral cartilages attach on either side of the palmar processes (wings). 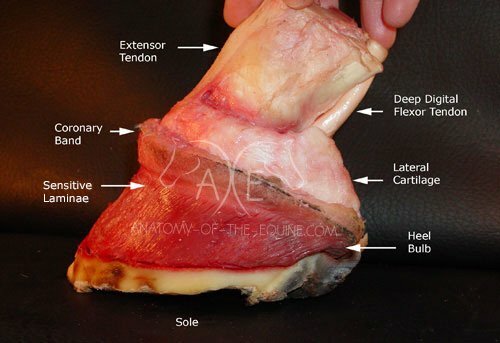 The photo below shows the different structures of the hoof. The hoof wall has been removed to reveal the soft tissues surrounding P3. Sensitive laminae cover the distal phalanx. 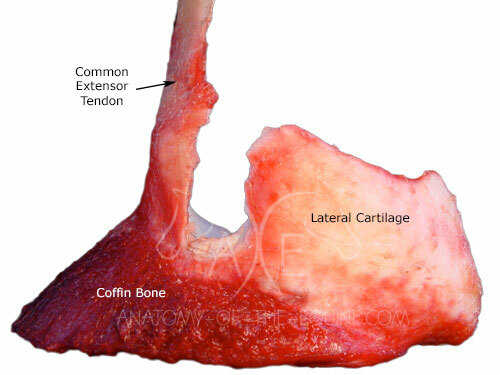 The coronary corium lies across many soft tissues such as the extensor tendon and lateral cartilages. Papillae on the coronary band grow the outer hoof wall, and the inner hoof wall is produced by the laminae. The distal phalanx is the anchor for many important structures. The extensor tendon tracks down the front of the leg and attaches onto the bone beneath the coronary band. The deep digital flexor tendon extends down the back of the leg and attaches to the under-side of the pedal bone. The deep digital flexor tendon and common extensor tendon allows the horse to move the leg. 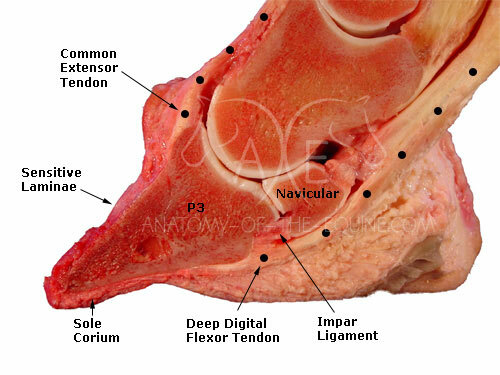 The impar ligament connects and nourishes the navicular bone. The sole corium produces the sole. The deep digital flexor tendon (DDFT) attaches between the wings (palmar processes) of the pedal bone. Directly above this tendon is the navicular bone. The deep digital flexor tendon anchors behind the ridge of bone known as the semilunar line. The caudal (back) of the hoof is formed by and lies between the lateral cartilages. The foundation for the lateral cartilages is P3. In the photo above, the short pastern bone (second phalanx) has been removed. 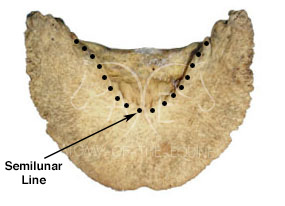 A small portion of the lateral cartilage was attached to the short pastern. The lateral cartilage is securely attached to the second and third phalanx (short pastern and P3). In the photo above, the lateral cartilage has been simulated using modeling clay to help show it's relationship to the pedal bone. 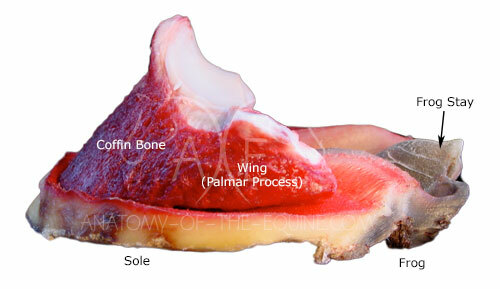 The lateral cartilage is cut away from the wing (palmar process) of the pedal bone. All the structures have been removed from the coffin bone. It was placed on the sole as a visual reference. This page just scratches the surface of the importance of the role of the coffin bone. 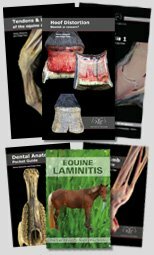 For those professionals who wish to learn more, we have produced a Coffin Bone eBook which gives a much more in-depth look at this vital structure. The video below showcases the eBook version (be sure to set your YouTube settings to high quality video).